James Goss and Arvind Ethan David co-wrote the first version of the play in 1992 in Oxford when they were sixteen years old students. On his former website about Dirk, James Goss wrote : “The script takes a very complex book, and forces it to make sense in two hours for a live audience. Since the book features all sorts of expensive things, such as time travel, alien spacecraft and ghosts, it is obvious that some things had to go.The Dirk Gently play is quite a miracle. 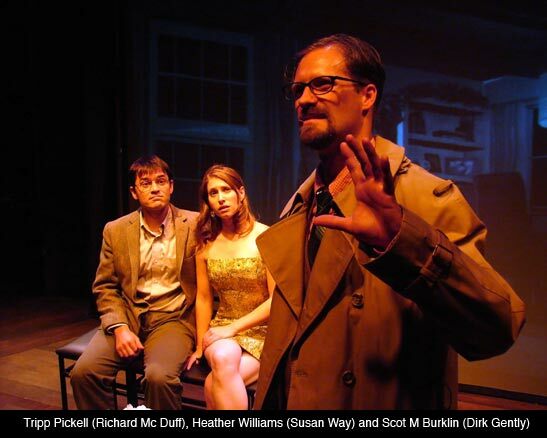 If staged versions of Hitchhiker’s have known various success, DIRK is now the recognized stage version of “Dirk Gently’s holistic detective agency” and I don’t think anyone who write a new play based on that book now. “It starts when we’re in the VIth form and are asked to direct a school play. Unable to find anything we want to put on (mainly because we were too lazy to actually read anything) we decide, with the careless hubris of teenagers, to adapt a novel. Not just any novel of course, but Dirk Gently’s Holistic Detective Agency”, a novel with a ludicrously complicated plot which spans 4 billion years, at least three alternative universes; a cast comprising vampire-detectives, aliens, ghosts, and an electric monk; all linked by the central theme of “the fundamental interconnectedness of all things” (hence ‘holistic’). We were sixteen, so didn’t bother to get rights clearance but just staged the thing. It was very short (about an hour) and by all accounts, amusing but utterly incomprehensible. It had a budget of forty pounds. A video recording of this production exists, but no-one is sure exactly why. Somehow, though, within the narrow confines of school cloisters, the play was a huge popular success. As such, it was a changing point in our school careers: too clever by half, overly academic, poetry quoting, playwriting adolescents seldom win popularity contests in British boarding schools; somehow, however Dirk’s popular appeal spread to its authors (or auteurs as we fancied ourselves) and suddenly, unexpectedly, we had street-cred. Fast forward 3 years: and we’re undergrads at Oxford, trying to make our mark on the University drama scene: Dirk once again comes to mind, and a re-written, re vamped production, rife with special effects, is born. This time, we figure we should get permission from Douglas’ agents – and being the terribly gracious Ed Victor and Maggie Phillips, they give it. More surprisingly, they come to see the show, and, enjoy it so much they tell Douglas that he must see it too – and on the penultimate night, the great man does. It was the summer of 1995, the beginning of the internet boom, and with the futuristic foresight that kept him ahead of the curve his whole life, Douglas was starting up a multiple media entertainment company – The Digital Village – which before becoming h2g2 and merging with BBC online, created the groundbreaking Starship Titanic game, struck the Hitchhikers film deal with Disney and, under the stewardship of Robbie Stamp, assembled one of the nicest and most talented teams in the history of the world. That was all in the future though, and that night, over Moroccan lamb, red wine and the adrenalin from meeting one of our idols, Douglas opened and then blew away our minds with conversation about theatre and the internet, writing comedy for interactive media, the convergence of entertainment platforms and the joy of collaborative creation. After Oxford, much to our surprise, there cane a seemingly never ending series of requests, from across the globe, to perform the play. Somehow the global Douglas Adams mafia had heard of the script’s existence, they ferreted pirate sections across the wilderness of the internet, and then started to email us. From Minnesota and Melbourne, from Buenos Aeries and Didcot, from universities and schools, from amateur dramatic groups and Douglas fan clubs, requests kept coming. As such, the play constantly got re-written and (hopefully) improved. Along the way, it grew increasingly away from the book that spawned it, becoming more true to its new medium, or its new milieu as Dirk would say. 1. The Electric Monk is gone. Sorry. 2. The Dodo is gone. REALLY sorry. 3. The number of alternative universes traversed by the story is reduced by 2. 4. Michael Wenton-Weaks is now a multiple murderer. The biggest casualty has been the electronic monk. Since he spent the book riding around on a horse with a shotgun, he was not immediately suited to the stage. So, for technical reasons, there is no electronic monk. Since he also committed the murder of Gordon Way, this may also cause some problems for purists. The ending is also much more streamlined, since the original book takes place in a parallel universe where Coleridge wrote all of Kubla Khan and there was no Bach. In the universe of the play there is a Bach, and Coleridge was foiled long ago. That just leaves us with a fistfight at the dawn of time and a dimensionally-troubled sofa to sort out. There, that makes perfect sense” ). Arvind and James wrote this production notes ten years ago. They are based on the experience they had with the various productions and most particulary on 1997 Crossbow Owford University Production : “DIRK is part play and part holistic multimedia experience. ‘Multimedia’ has become such a hackneyed phrase, but in this case, it is dangerously accurate. When you have a play with a time span of 4 billion years, a cast that includes ghosts, aliens and Cambridge dons, and a study which travels through space/time at the drop of an abacus, you have to be a little inventive. `Here are a few suggestions for its staging. You should feel free to interpret them according to your means and whims. 1. Dirk FAT – get a team of crack animators and filmmakers to produce a series of short filmed and animated sequences, incorporating your live action cast – pay particular attention to the “beginning of life” and “time travel” sequences. 3. Dirk JUNIOR (recommended for school productions) – No screen. Loud lighting and lots of smoke and mirrors. This text throughout assumes the full, FAT experience. 1. Reg’s study – a cosy sofa, lamp, and chair scenario, with a coffee table, prominent on which is an abacus. A hatch leads to a kitchen, a staircase leads to a bathroom. 2. Dirk’s office – two desks (Dirk’s and his secretary Janice’s), chairs, a light, hat-stand, and telephones;. 3. Susan’s flat – a cello (or other suitable musical instrument) and a sofa. 4. Richard’s Flat – living room and computer filled study, linked by staircase which is partially blocked by a (firmly wedged) sofa. 5. A large central area which passes for halls/roads/cars/breathing space. This is a play of conjuring tricks. In an ideal world, all the conjuring tricks from Reg and Dirk should be properly and expertly performed using skill, charm, and extreme legerdemain. Unless you are lucky enough to have Penn & Teller (or unlucky enough to have David Copperfield) in your cast, some boning up on basic sleight of hand techniques may be necessary. We recommend the following book: Now You See It, Now You Don’t: Lessons in Sleight of Hand (Bill Tarr, Barry Ross, Vintage Books USA; ISBN: 0394722027), as a good primer. The relationship between music (in particular the music of Johannes Sebastian Bach), mathematics and the natural world is central to the plot of the novel. Dramatic imperatives, sadly, have made this rather less so in the play. Nevertheless, the choice of music is important, and we have indicated appropriate pieces at various junctures in the text. Richard’s Flat. It is split over two floors – the main area and the computers in the gallery. The screen displays the slowly rotating sofa. One policemen stands on guard. He is holding a hacksaw, and making trial saws at the air. DIRK: You – the sofa in the stairwell. Guard it. Do not let anyone touch it, and I mean anyone. Understood? POLICEMAN: I’ve had orders to saw it up. DIRK: Countermanded. Watch it like a hawk. Stay here. Do not let anyone pass, and I mean, anyone. Understood? DIRK: (points to waste bin) Have you searched that? DIRK: Search it again. Keep searching it. Who’s here? DIRK: I haven’t got all day. DIRK: Good. Morse is off the case. I’ll be in here if I’m wanted (inner room), but I don’t want any interruptions unless it’s very important. Understood? DIRK: I don’t see you searching the wastepaper basket. DIRK: I want it deep-searched. You understand? Dirk sweeps past him, up into the balcony makes a cursory examination of the flat, and heads up the stairs for the computer room. He fiddles with the computer etc. Sergeant Gilks enters, takes one look at the wastepaper basket, clips the Policeman smartly over the head and bellows up into the gallery. GILKS: I should hope it bloody did, especially if you had to take the bloody thing down stairs at one o’ clock in the bloody morning.. What the hell are you doing here? DIRK: Why Sergeant Gilks, I am here in pursuit of justice. GILKS: Well wouldn’t mix with me then. (Turns momentarily away) What do you know of MacDuff and Way? DIRK: (badly) Oh, ah, nothing. (pockets tape) Oh, that MacDuff and Way. Of Way I knew nothing beyond common knowledge. MacDuff I knew at Cambridge. GILKS: Oh, you did, did you? Describe him. DIRK: Tall and absurdly thin. And good natured. A bit like a preying mantis that doesn’t prey – a non- preying mantis if you will. A sort of genial mantis that’s given up preying and taken up tennis instead. And of course, completely incapable of murder. GILKS: That’s for us to decide. Is he your client? GILKS: All right Gently, where is he? DIRK: I haven’t the faintest idea. GILKS: I’ll bet you’ve got a billing address. GILKS: Look Gently, this is a perfectly normal, harmless murder enquiry, and I don’t want you mucking it up. So consider yourself warned off as of now. If I see a single piece of evidence being levitated I’ll hit you so hard you won’t know if it’s tomorrow or Thursday. Now get out, and give me that tape on your way. DIRK: (Genuinely surprised) What tape? GILKS: Look Gently, just because you think you’re bloody clever doesn’t mean that everybody else is stupid. If I turn away it’s for a reason, and the reason was to see what you picked up. I didn’t need to see you pick it up, I just had to see what was missing afterwards. We are trained you know. We used to get half an hour Observation Training on Tuesday afternoons. Just as a break from four hours solid Senseless Brutality. Dirk produces tape with a sigh. GILKS: Now put that tape back in the machine, and play it. Let’s see what you didn’t want us to hear. DIRK: It wasn’t that I didn’t want you to hear it. I just wanted to hear it first. Dirk puts tape in answering machine. GILKS: So do you want to give us a little introduction? GILKS: Yeah, I know all that. What’s the point? DIRK: Well, I believe there may be a message on the tape from Gordon Way last night. GILKS: I see. OK. Play it. The tape plays. As it does, Gordon, dressed entirely in white enters, near Gilks. He is shot (on the tape), and jerks back. Dirk stops the tape. GORDON: It’s not finished yet, it’s not over, keep playing the tape, for heavens sake man, well, for my sake, really, oh play the tape. Damn you! DIRK: (Not quite hearing, or seeing) If you want something then let me know, but do not dare touch my mind. Gordon’s ghostly voice is heard over the answering machine: ‘Susan! Susan, help me! Help me for God’s sake. Susan I’m dead and I don’t know what to do’. Gordon looks expectant, hoping that Dirk will now be able to help him. DIRK: I’m sorry but I have the welfare of my client to consider. If this tape is to establish the time of Gordon Way’s death, then I don’t want any embarrassing examples of Gordon speaking to turn up on it after that point – even if they are only to confirm that he is in fact dead. Discordant howling as Gordon runs around the room flinging books and furniture, mostly into the gallery at Dirk. Gilks enters on the ground floor. GILKS: (Ducking a book) I’m going to come in again, and when I do, I don’t want to see anything of this kind going on whatsoever. Understood? DIRK: If you want my help, don’t you ever embarrass me like that again! Now, go! Gordon scowls at Dirk, and stops throwing the furniture. He storms off, kicking the waste-bin and Gilks comes back on. GILKS: (re-entering and surveys mess) Ah, there you are. I’ll pretend I can’t see any of this, so that I won’t have to ask any questions the answers to which would, I know, only irritate me. What’s that tape doing? DIRK: (Coming down the stairs) I think, Sergeant Gilks, it would suffice if we merely said ‘ahhh’ and left it at that. James and Arvind wrote the first one hour long version of the play. As said above “We were sixteen, so didn’t bother to get rights clearance but just staged the thing. It was very short (about an hour) and by all accounts, amusing but utterly incomprehensible. It had a budget of forty pounds. A video recording of this production exists, but no-one is sure exactly why”. First authorized version of the play. According James and Arvind (see above) : ” Fast forward 3 years: and we’re undergrads at Oxford, trying to make our mark on the University drama scene: Dirk once again comes to mind, and a re-written, re vamped production, rife with special effects, is born. This time, we figure we should get permission from Douglas’ agents – and being the terribly gracious Ed Victor and Maggie Phillips, they give it. More surprisingly, they come to see the show, and, enjoy it so much they tell Douglas that he must see it too – and on the penultimate night, the great man does”. James Goss wrote on his website : “1995 saw the return of Dirk, in a rather more glamorous production. A substantially changed script transferred Dirk to the Old Fire Station theatre in Oxford. It was the first show in Oxford to feature computer animation, and was a complete blast. It was a huge personal triumph for all involved. Producer Matt Wreford got to go to Le Manoir on the returns, author Arvind David got to direct, and author James Goss got to take his finals in the same week. Produced by Matthew Wreford and directed by Alex Potts. Big production. James Goss has even built the first website and online ticket booking for UK theatre production. From James Goss’ former website : “1997 was the third production of Dirk at the historic Oxford Playhouse. The budget had grown up, much helped by a lottery grant. The OUDS production featured a talented cast of Oxford students, including Rory Kinnear as Dirk, boggling computer animation and a fantastic set. In order to adapt to the huge new scale of things, the script was expanded considerably, and physical theatre director Alex Potts was engaged by Crossbow productions. First version of the play staged outside Oxford. This London Premiere was a success. You can read a review of their version here. Chris Davis, who worked on this version, epxlained to me that ” We were keen to put this on in the year of Douglas’ death (and I believe were the only group to do so) as a celebration of his work and as such, I was given permission to alter the original play script to re-instate an ending which was more true to the book (and explained the sofa)… I was pleased that Douglas’ family attended one night and were complimentary about the production”. You can get more details about OGTC past and present productions on their website. The Australian premiere of Dirk was launched just after Douglas’ death. Jo Marsh, director of the play, and Patrick Spicer, The Prodroduction Manager of Vagabond Theatre, are “huge fans of Douglas Adams and were shocked and saddened by his sudden death… We believe this is the best tribute we, as fans of his work, could give such a legendary man who has given so many people an ability to see the absurd humour of life when the chips are down. Not only has he given me reason to live life to the fullest but also to realise that “Don’t Panic” is one of the best things to remember when putting on a theatre production.” You can read a review of the play here. 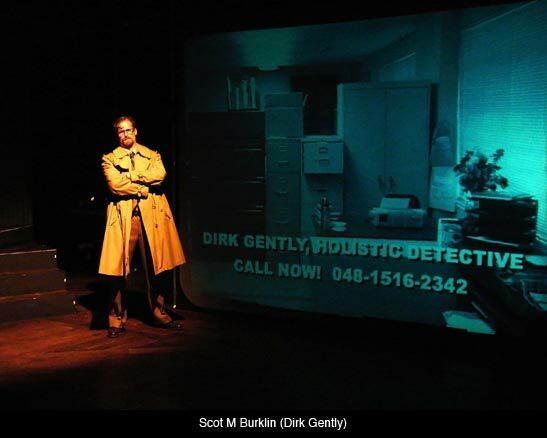 The US premiere of Dirk was staged at Los Angeles in october 2006. The stage was a big success and got an excellent review from Variety.